After months of heated rhetoric and diplomatic groundwork, talks to overhaul the North American Free Trade Agreement will formally begin this week with Canada pushing for more stringent labour and environmental standards in the deal. 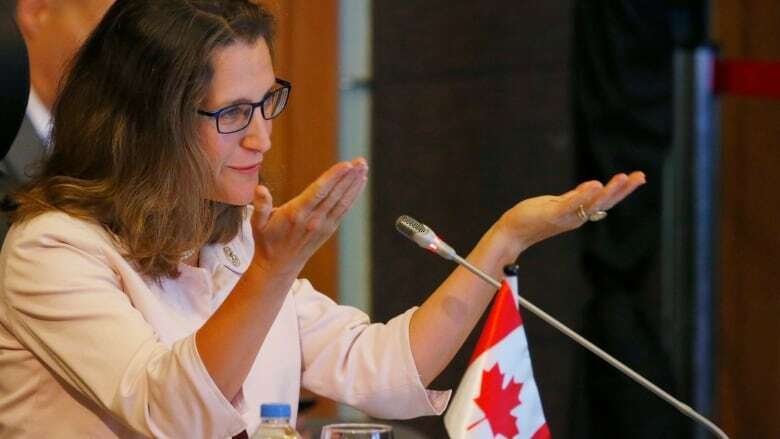 Canada's top diplomat, Foreign Affairs Minister Chrystia Freeland, will travel to Washington Tuesday where the first round of formal negotiations is set to take place. Freeland will sit down to break bread with her U.S. and Mexican counterparts before officials get down to brass tacks in a bid to modernize the 25-year-old trade pact Wednesday. Each side will begin to set out what it wants to see in the rewrite; in Canada's case that will include stronger environmental and labour provisions and a formal mechanism to settle thorny trade disputes. Before that formal kickoff in Washington, Freeland was delivering a speech at the University of Ottawa on Monday morning, outlining in broad strokes Canada's objectives for a renewed NAFTA. She will then move to the hot seat on Parliament Hill, where she will take questions from the Commons committee on foreign affairs and international development later Monday morning. CBCnews.ca will carry her testimony live starting at 10 a.m. ET. Some interest groups are hoping for a speedy process to keep investors calm, but some international trade experts warn that business should brace for a drawn-out series of discussions. Jeffrey Schott, a trade policy analyst and senior fellow at the Washington-based Peterson Institute for International Economics, said while the goal is for expeditious rounds, the administration of U.S. President Donald Trump has laid out objectives that could lead to an impasse. Those include proposed changes to government procurement, rules of origin and a goal of eliminating the U.S. trade deficit. "Those are areas where they will undercut the competitiveness of North America producers and workers and there will be resistance from Canada and Mexico to the U.S. overtures," he said. Schott expects talks will spill over to next year, and will then be constrained by next year's Mexican presidential election, followed by U.S. mid-term congressional elections. He predicted talks will continue on into 2019, when there will be other elections, including a federal election in Canada. "I see a low probability of an agreement on a modernized NAFTA in the near term," he told CBC News in an interview. "I think negotiators will go through what can be done that is helpful and reject efforts to try and make revisions that are counterproductive. But finding the discreet window when the political stars align in all three countries is going to be difficult, and is unlikely to take place over the next 18 months." Schott expects quick, constructive progress in areas like digital trade, but said changes to labour provisions could spark much friction. While the U.S. has far greater issues with Mexico, Trump's aim to shred Chapter 19 of NAFTA, which includes provisions for a dispute resolution mechanism, could prove to be a flashpoint with Canada. Speaking to reporters in Edmonton on Friday, Freeland called a dispute settlement resolution "essential" to any trade agreement. "In the same way that good fences make good neighbours, a good dispute mechanism makes good trading partners," she said. "Canada understands the importance of independent, objective, transparent dispute settlement within NAFTA, and it's something we'll be talking about with our partners and explain it to them." Dennis Darby, president and chief executive officer of the Canadian Manufacturers and Exporters, called the dispute mechanism a potential "deal breaker." "In particular, for manufacturers, it is clear Chapter 19, the dispute-settlement mechanism that decides the rights and wrongs of trade disagreements, can not be eliminated as the U.S. requested," he said. While the existing NAFTA framework has been an economic success, Darby said technological advances have reshaped the way North Americans work, travel and communicate. "A redrawn NAFTA offers a platform to empower innovation as the driving force of manufacturing and economic growth," he said. "It is also an opportunity to identify and eliminate some of the challenges that manufacturers are currently facing in the North American market such as non-tariff barriers, protectionist policy, and stimulate job creation through the flow of skilled labour." In the run-up to NAFTA renegotiations, the Liberal government waged a massive outreach to U.S. officials to send a message about the mutual importance of NAFTA to jobs and prosperity on both sides of the border. Since Trump's inauguration on Jan. 20, Prime Minister Justin Trudeau, cabinet ministers, parliamentary secretaries, premiers and provincial/territorial ministers, parliamentary committees and other parliamentarians have made more than 175 visits to the U.S. or engaged with senior officials in Canada, according to data provided by Global Affairs Canada. John Ries, a trade economics professor at the University of British Columbia, said it's difficult to gauge if the heavy diplomatic push will translate to gains for Canada. "Talking is good, but ultimately it's dollar and cents and vested interest," he said. Ries expects a deal will include possible adjustments on tariff exemptions for online shopping and some liberalization of supply managed poultry and dairy that would allow more U.S. imports into Canada. While the federal government would need to craft a plan to help those agricultural sectors transition, he said it would not necessarily be bad for Canadian consumers. "The worst case scenario, where Canada ends up providing more access for Canadian consumers to American dairy and poultry and e-commerce online purchasing, is not that horrible of an outcome for Canada as a whole," he said. Randy Hoback, Canada-U.S. relations critic for the Conservatives, was critical of the Liberal government for not concluding a softwood lumber agreement ahead of the NAFTA negotiations. He emphasized the need to focus on job creation in NAFTA talks and urged Freeland to lay out Canada's negotiating position. "Conservatives care deeply about protecting well-paying jobs created by free-trade agreements," he said in a statement. "It is our hope that Minister Freeland will take the opportunity on Monday during her appearance before the international trade committee to reassure Canadians and Canadian businesses by providing a detailed summary of Canada's negotiating objectives and expected outcomes from the NAFTA negotiations."